Thirty years ago—in November 1988—the novel as an art-form sputtered out and died. And a man named Neil Gaiman killed it. None of that is true, of course. At least, none of it is true in the sense of being the actual particulars, the genuine facts on the ground. Novels didn't cease to be written. Novelists didn't forget that book-length fiction was one of the central devices by which modern times tried to explain itself to itself. Publishers didn't fold up their businesses and steal away into the night. There's a lot of ruin in an art-form, and the novel, with its sneer of cold command, yet gazes out on the world of art it claims to dominate. Still, at the end of 1988, a 28-year-old Englishman published a comic-book series called The Sandman, and it meant something—something about the fading conviction that traditional fiction was the highest path, the greatest art. Even the most powerful cultural commitments to an art-form can change, of course. In the Poetics, Aristotle named epic poetry as the summit of the artistic impulse, and as late as Dante in the 14th century, with the Renaissance revival of classical learning, this remained the accepted view. But by the time Paradise Lost was finished in 1667, the surprise wasn't so much that Milton had written a good epic, but that he had managed to write an epic at all. Epic poetry had come to seem a strange device of olden days—with drama and lyric poetry (and, in the 18th century, the novel) taking its place. And so, too, through the second half of the 20th century, it was common to hear nattering about how movies and even the vast wasteland of television were seizing territory that books once occupied. It was Marshall McLuhan, man, telling us the medium is the message. And it was Neil Postman crying that television is Aldous Huxley's Brave New World come to life, as we amuse ourselves to death. I'm not sure anyone would have predicted the rise of comic books—or the "graphic novel," to give its non-U title, following the inflationary principle that substitutes custodial manager for janitor. Jonathan V. Last recently argued that Stan Lee occupies roughly the morphological space of P.T. Barnum, the man without whom the modern circus would not have come to exist. Stan Lee hardly invented comic-book art, and he certainly wasn't its greatest practitioner. But he created the comic-book industry in its modern form, and without Lee's promotional work, we wouldn't have our now apparently endless production of superhero movies and cultural references. As it happens, Gaiman published The Sandman with DC Comics, the major rival of Stan Lee's Marvel Comics. The 1980s saw much pushing at the seams of traditional comic-book settings. Frank Miller's breakthrough came with Ronin in 1983. Alan Moore produced V for Vendetta between 1982 and 1985. But Miller and Moore were, in essence, pathbreaking comic-book writers. Neil Gaiman was something else—a writer with novelistic talent and novelistic goals, writing a comic book instead of a novel. Some of the reason was surely happenstance. Through his early 20s, Gaiman was mostly just a young writer on the make. He wrote a quickie biography of the pop band Duran Duran. He compiled Don't Panic: The Official Hitchhiker's Guide to the Galaxy Companion. He poured out articles for British magazines under a variety of pseudonyms. And then, through the efforts of Karen Berger, a DC Comics editor, he produced the storyline for comics that revived and reinvented a defunct DC Comics character named the Sandman. The first series would be published in book form as Preludes and Nocturnes in 1989, and more than 10 other volumes followed—with Endless Nights becoming the first graphic novel to appear on the New York Times hardcover bestseller list. He started, he says in the new 30th-anniversary edition, with a picture in his mind, an image of "a man, young, pale and naked, imprisoned in a tiny cell, waiting until his captors passed away, willing to wait until the room he was in crumbled to dust." Preludes and Nocturnes collects the first series of eight issues of the Sandman comic, telling how Aleister Crowley-like occultists capture and contain for decades a strange supernatural being named Dream. Or Morpheus. Or the Prince of Stories. Or the Sandman. In the original DC Comics version, the Sandman was a fairly standard superhero, albeit one with the ability to induce sleep and influence dreams. 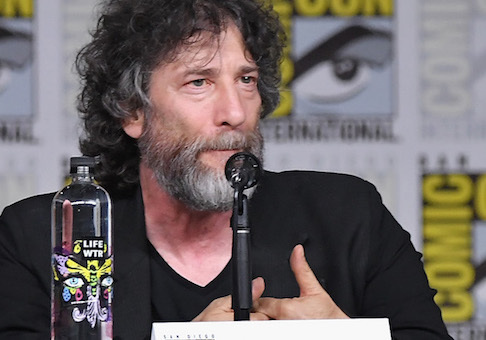 In Gaiman's hands, he became instead an anthropomorphic representation of an eternal theme: less like Superman and more like Death. The strangeness of the times in which Gaiman wrote, the 1980s woes of the modern age, are implicitly ascribed to the absence of Dream, prince of stories—held for a generation while the occultists tried to figure out how to harness his power. Soon after the story opens, however, Dream escapes and begins his efforts to gather again the tools he had used to perform his work. He travels to Hell to claim from one of Lucifer's demons his missing helm, and he teams up with another DC Comics character, Hellblazer's John Constantine, to find his satchel of sand. The final tool, a ruby talisman, falls into the hands of the insane "Dee," the mad persona of the super-criminal Doctor Destiny. "24 Hours," the portion of the story where Dee uses the ruby to torture people in a diner, Gaiman himself describes as "one of the very few genuinely horrific tales" he's ever written. In the final section, he accompanies his sister—the grim reaper, another of the anthropomorphic eternals—on an afternoon of her rounds. In some ways, the Sandman books are a disastrous hodgepodge. Cain and Abel are recurring characters. So is G.K. Chesterton. African tribesmen wander in to the book to tell stories. So do punk rockers. It's as though, in this first opening of his imagination, Gaiman twisted the spigot too far, and more came pouring out than comic-book pages could contain. Through it all, however, he was seeking something akin to the Jungian archetypes. He wanted to reach down into the deep stuff of legend and make his own story out of the root elements of storytelling. Superhero comics always splashed happily in the shallows of myth. Gaiman's Sandman tried instead to dive into the deep waters of the mythopoeic. He would reach his goal better in his novel American Gods. The script he reworked into the story Neverwhere. Even such children's books as Coraline, such romances as Stardust, and such nonfiction as his Norse Mythology. But the novelistic goals he had were channeled away from the novelistic talent he had by their original appearance in comic books. In other words, the novel as an art-form didn't seem the only—the obvious, the necessary, the first—place for artistic ambition with the literary genius Neil Gaiman had. And that says something, doesn't it? Something about the fading conviction that traditional fiction is the highest path, the greatest art?